Amid rumors among Russian media outlets that Moscow's top envoy to Ukrainian peace negotiations has resigned, the top U.S. interlocutor says he expects Russia to return to the table with a peacekeeping proposal. U.S. Special Representative for Ukraine Negotiations Kurt Volker, who last met with his Russian counterpart Vladislav Surkov in January, told VOA he had not received word on Surkov's status or about a new meeting. 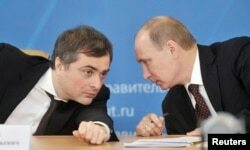 His last discussion with Surkov, Volker said, left him with the impression that Moscow would soon "come back to us with a proposal for how a peacekeeping force could grow in terms of geography and mandate and along a timeline." "That would be very interesting to see, and we would be very prepared to sit down with the Russians to talk about that," Volker said. "We remain ready to bring peace to this region, but we need to hear from the Russians." Volker arrived Tuesday in Donbas to discuss the security situation near the front lines with Ukraine's Joint Forces Commander, Lieutenant-General Serhiy Nayev. The U.S. Agency for International Development (USAID) said Monday it would provide Kyiv with $125 million for infrastructure rehabilitation projects in Donbas and adjacent territories. Donbas, an area bordering Russia that is populated by ethnic Russians and Ukrainians, is where Russian-backed separatist forces first battled Ukrainian forces after Russia's 2014 annexation of Crimea, destroying much of the local infrastructure. While Moscow insists local ethnic Russians self-organized their defense, substantial reporting by various observers and international rights groups such as Amnesty International and Human Rights Watch indicate Russian army units provided direct support. In February, OSCE monitors said fighting had escalated to its worst level in months, after the shelling of a front-line village wounded eight civilians and destroyed or damaged dozens of homes. En route to a meeting Tuesday with Ukrainian officials and security monitors at the Joint Center for Control and Coordination (JCCC), Volker told VOA's Ukrainian Service that Kyiv's military commanders, while appreciative of the restoration aid, "do want support for their defense capabilities, which we think are important to provide." Since Russia's December withdrawal from the JCCC, a Ukrainian-Russian group intended to ensure the safety of OSCE monitors and help implement the Minsk agreement, Ukrainian military brass have found it increasingly difficult to maintain the cease-fire status necessary for restoration work to be carried out. Volker said Russia, by withdrawing from the JCCC, which allowed Russian and Ukrainian military leaders to collaboratively defuse firefights and reinforce implementation of localized cease-fires, has forced Ukraine and its allies to attempt direct negotiations with local "puppet regimes." But the local separatist groups, Volker added, aren't actually controlling events along the front lines. "And so you need to talk to the Russians to be able to effectively communicate about things like [cease-fire implementation], and they've pulled back from the JCCC," he said. Volker said civilians and the military all talk about the need for a cease-fire. "Everything from repairing electricity and water filtration lines and pumps, and the boundary crossings themselves, where there may be a bridge or a road, these things all have to be repaired and made safer. It's very difficult to do when there is active fighting," he said. He added that Donbas region residents say they want a peace agreement that restores territorial control to Kyiv. "And these were clearly ethnic Russians, as you could tell by the language they spoke," he said. "That Russian speakers are pro-Russian or that this is an ethnic conflict, just clearly isn't true." On Secretary of State Mike Pompeo's first day in office, top U.S. officials attending a NATO ministerial meeting in Brussels said the United States would refuse to "return to business as usual with Russia" until Moscow withdrew "forces and support for proxies in the Donbas, and [returned] control of Crimea to Ukraine." After separate meetings with President Donald Trump, Defense Secretary Jim Mattis, National Security Adviser John Bolton and Pompeo, Volker said "everyone is on the same page" regarding U.S. policy on Ukraine. Asked whether lethal aid would remain on the table, Volker was unequivocal. "Ukraine is fighting a war on its own territory. Soldiers in Ukraine are dying on Ukrainian soil every week, defending the territory of Ukraine. So this is about self-defense of a nation," he said. "Ukraine has very capable militaries, substantially rebuilt since 2014, and produces most of its own defense equipment, but it does have some gaps," he added. "And it's perfectly reasonable for friends and allies of Ukraine to supply those arms so they can fill those gaps in their defenses. "There is no restriction on this anymore," he said. "The idea of a blockage on arms sales to Ukraine is over, and it's really a question of what makes sense. What's necessary for Ukraine's self-defenses?" This story originated in VOA's Ukrainian Service. Some information came from Reuters.